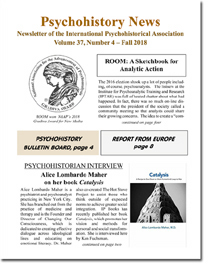 If you would like to receive regular news from the International Psychohistorical research community, please subscribe for free to our Newsletter in French and English by clicking the above link. An automatic message of welcome will be sent to you. You may also want to download past issues of Clio's Psyche available for free on Paul Elovitz's website. This is part 1 of the distinguished panel on Psychohistory at the Crossroads: Learning from the Past and Present, presented on June 3, 2015 at the Annual Conference of the International Psychohistorical Association. Moderator: Ken Fuchsman, Ph.D. Panel members: David Beisel, Ph.D. (SUNY Rockland); Molly Castelloe, Ph.D. (Metropolitan College of New York); Paul Elovitz, Ph.D. (Ramapo College, NJ), David Lotto, Ph.D., Peter Petschauer, Ph.D.
Dr. Diane Perlman presents "The Nuclear Mystique: Seventy Years after Hiroshima/Nagasaki" at the International Psychohistorical Association conference at NYU, June 2015. (Part 1, 2, 3 of 3). Diane Perlman, Ph.D. is a clinical and political psychologist, mediator, and visiting scholar at the School for Conflict Analysis and Resolution at George Mason University. Her work encompasses the psychological dynamics of enmity, nuclearism, and terrorism, as well as conflict transformation and the design of alternative security policies. Dr. Perlman participates in United Nations conferences and non-governmental organizations and is co-author with Joanna Santa Barbara and Johan Galtung of Reconciliation: Clearing the Past, Building a Future. Visit her website at www.consciouspolitics.org. Myriam Miedzian presented on “Roots of Terrorism and War: Economic Interests Meet Machismo" at the Annual International Psychohistorical Association Conference at NYU - on June 3rd, 2015. Myriam Miedzian, Ph.D. is author of Boys Will Be Boys: Breaking the Link between Masculinity and Violence and He Walked Through Walls: A Twentieth Century Tale of Survival and co-author of Generations: A Century of Women Speak about Their Lives. Dr. Miedzian's blogs on political, social, and cultural issues appear in several online publications including the Huffington Post. They can also be found on her website: www.myriammiedzian.com. Dr. Sue Grand's keynote at the International Psychohistorical Association Annual Conference: Racial History in America: Collective Shame and Absent Memory. Sue Grand, PhD, is the instructor and supervisor at the NYU Postdoctoral Program in Psychoanalysis; associate editor of Psychoanalytic Dialogues and Psychoanalysis, Culture and Society; and a psychoanalyst in private practice. She is the author of The Reproduction of Evil: A Clinical and Cultural Perspective and The Hero in the Mirror: From Fear to Fortitude. IPA 2015: Dr. Paul Elovitz, A Comparison of Leadership in Early Freudianism and Psychohistory. Paul H. Elovitz, PhD is a Director of the Psychohistory Forum, Historian, Psychoanalytic Psychotherapist, Professor (Ramapo College), and Editor, Clio's Psyche. For more information about Dr. Elovitz, visit http://www.ramapo.edu/sshgs/faculty/paul-elovitz/. Dr. Alan Mohl presents at the Annual Conference of International Psychohistorical Association: Leonardo da Vinci: Portrait of a Genius. Allan Mohl, Ph.D., LCSW, psychoanalyst in private practice; served as a member of the New York City Department of Education’s Special Education Committee, and as a developer of the TIP Neighborhood House Family Unit. He is also a member of The New York Academy of Sciences, the New York Disaster Counseling Coalition, the American Association for Marriage and Family Therapy, and the American Orthopsychiatric Association. 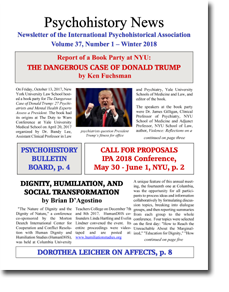 Dr. Jerome C. Wakefield presented "The Little Hans Case and the Questionable Foundations of Freudian Oedipal Theory" at the International Psychohistorical Association Conference at NYU on 6-3-15. Jerome C. Wakefield, DSW, PhD is a Professor of Social Work and Professor of Psychiatry at New York University, and Honorary Faculty in the Institute for Psychoanalytic Education. Dr. Wakefield is the author of “All We Have to Fear: How Psychiatry Transforms Natural Fear into Mental Disorder” and 200 other publications in psychology, philosophy, psychiatry, psychoanalysis, and social work, dealing with issues at the intersection of philosophy and the mental health professions. Dr. Jeffrey Seinfeld Memorial Panel was presented at the Annual International Psychohistorical Association Conference at NYU - on June 5th, 2015. 3. On Jeffrey Seinfeld's Legacy of Examining Cultural Artifacts as Tools for Personal and Professional Growth. - by Robinson Lilienthal, PhD. 4. Jeffrey Seinfeld's Thinking Related to Dialectical Psychological Experience. - by Susan Kavaler-Adler, Ph.D., ABPP, D.Litt.